Around 12 months ago the idea of a Charity Quiltathon were born. 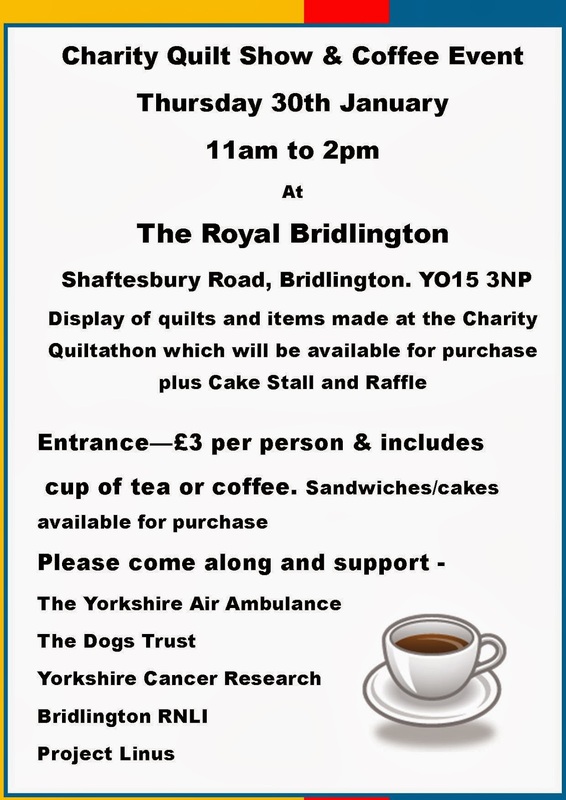 We have been holding workshops and retreats here at The Royal Bridlington for several years and now have a large database of quilter and many regulars. We came up with the idea of supporting more than one charity so that the event would have a very broad appeal. The charities are - Yorkshire Cancer Research, Yorkshire Air Ambulance, Bridlington RNLI, The Dogs Trust and Project Linus. Quilters have been donating fabric, blocks, UFOs etc for several months and I have been storing all the carrier bags full of these wonderful goodies all over the place. Bridlington Sewing Centre donated two whole rolls of wadding. Scarborough Sewing Centre donated 10 meters of fabric. Phillip Anthony Photographers from Tickton donated £375 vouchers for the raffle. Lloyd Dowson donated a case of wine. As the bags loads started to arrive, it soon became evident that we would have plenty to see, so the idea of a Quilt Show was formed. In preparation for our two day event, I started to sort through these a couple of weeks ago with the help of Barbara Hall from Bridlington Sewing Centre . We had been given a number of quilt tops which needed backing, wadding, quilting and binding - so as you have probably read earlier on my blog, I started to get these done on my ABM Innova longarm. I have pictured some of these on my previous blogs and here are some of the ones I have done in the last few days. This is a project which I started just the day before at a workshop and I converted into a bed runner and cushions. When I counted up the quilts just before the quiltathon, I had quilted 35 tops! Barbara has also been such a great help too by sewing down some of the bindings. So here are some of the ladies who volunteered their time to came along. In return for their hard work, The Royal Bridlington provided refreshments, Homemade biscuits, cakes and lunch. Overnight accommodation for those who required was also very much reduced. Just a little taster of some of the fabulous items these very clever ladies have made. There will be many more to come back as I think everyone have taken something home to finish off or start and finish too. I will also be busy with lots more quilt tops to quilt. Thank you so much to everyone who gave up their time and to all those who donated to the event and the wonderful surprise the quilters sprung on us on Wednesday. Please come along on the 30th January - there will certainly be lots to see and buy and all for some very worthwhile charities too.